Let me tell you, this is one AMAZING cornbread. It’s full of flavor and ready in no time! 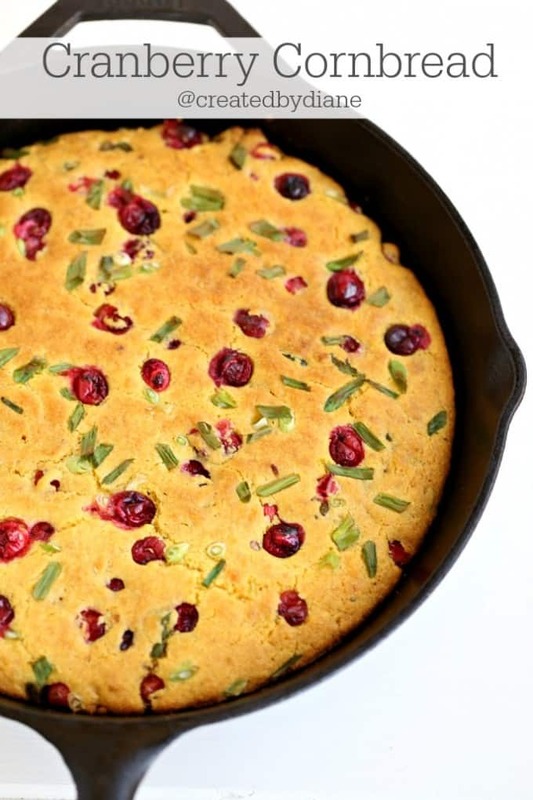 Kick up the side dishes this Holiday with this gorgeous cornbread. This cornbread is full of flavor and wow your guests. I cooked it in a cast iron skillet (which happens to be my favorite) but you can bake it in any pan you choose. This is another item you can make ahead of time, even the day before and then you can heat it up before serving if you prefer. 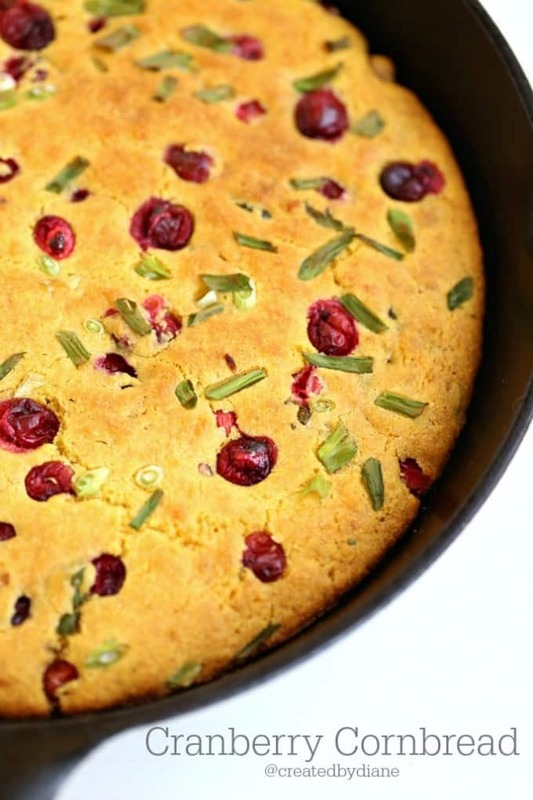 There is so much flavor in this cornbread it’s crazy. I melted some butter in the hot skillet and cooked a diced jalapeno before added the batter to the pan. WOW! that gave it just a delicious undertone of flavor that is enjoyed in each and every bite! I love jalapenos for added flavor and a little heat. I’ve mentioned this many times, if you like jalapenos you’ll love this, if they aren’t your thing, you can skip them or add 1/2 of a diced bell pepper in its place. You can adjust the spice in this dish by smelling the jalapeno as you cut it. It’s it has a super strong aroma maybe add half. The jalapenos I use are not TOO spicy. 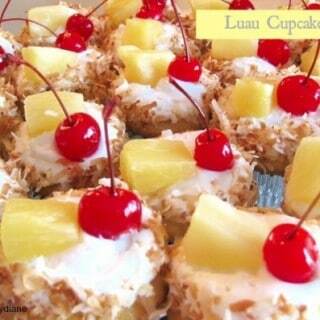 They have great flavor and my family is able to eat them without any problems. However sometimes when I shop at a different store I may get some that are really spicy, those I would then use only half of what the recipes calls for. 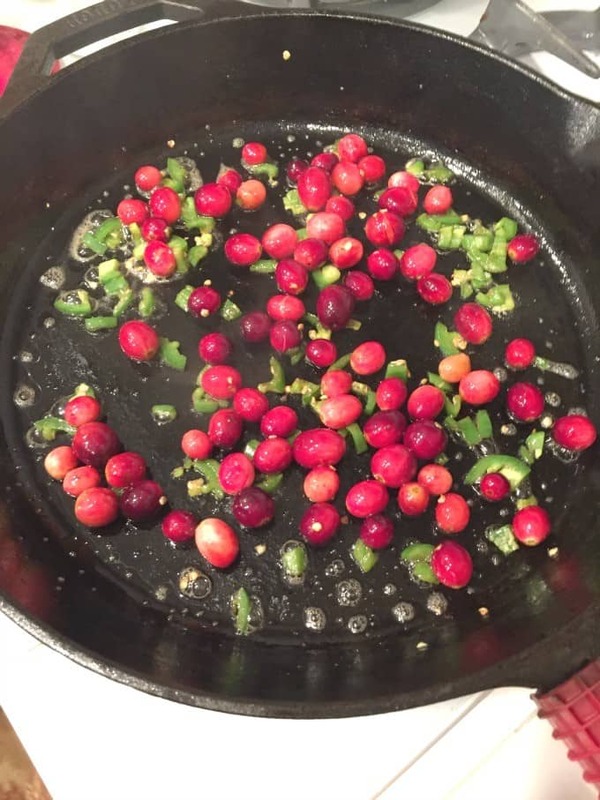 Now those cranberries really give this dish a great color and tangy flavor that goes great with the jalapeno and green onions. If you like jalapenos like me, you may want to make this Jalapeno Cranberry Sauce. In a medium bowl combine cornmeal, flour, baking powder, baking soda and salt together. 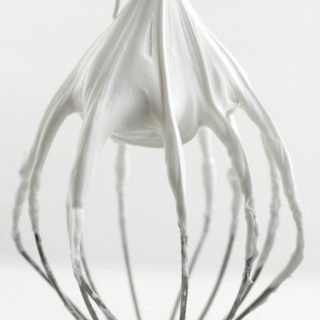 Add to it the buttermilk and the melted butter along with the eggs and mix just until all the dry mixture of moistened. Stir in ¼ cup cranberries and ½ the amount green onions. heat the cast iron skillet on medium heat, melt the butter cook the jalapeno for 1 minutes. 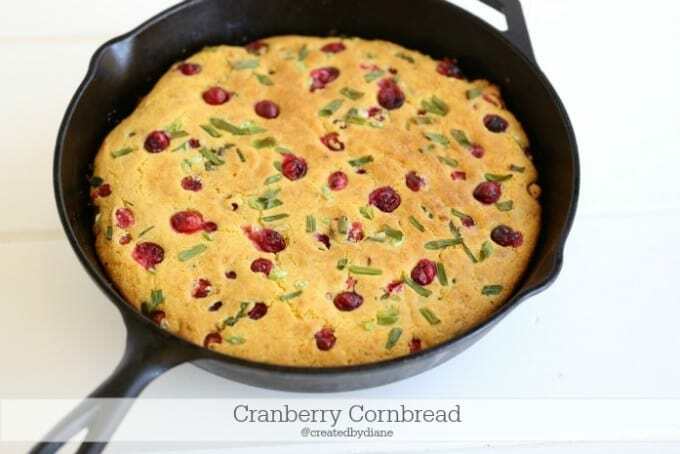 Pour the batter into the skillet and stir it gently to spread it out and distribute the cranberries in the pan. 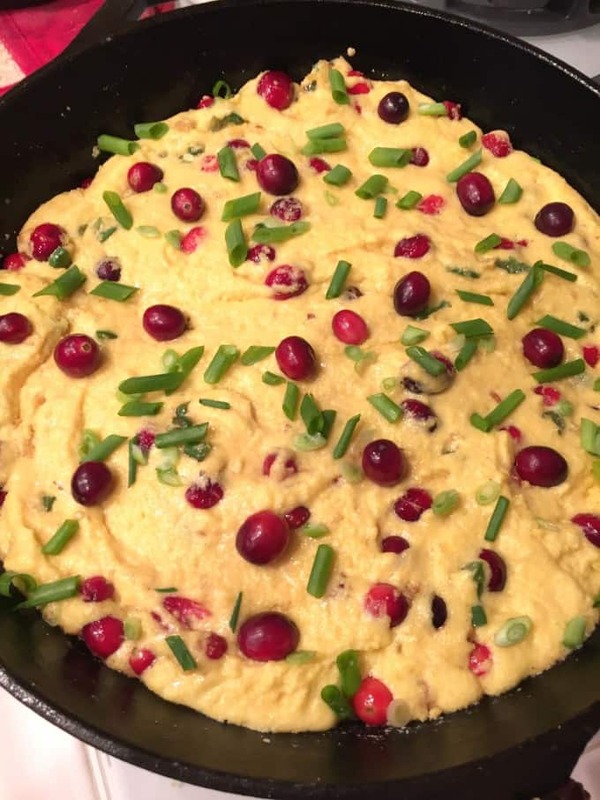 Top the mixture with the remaining ¼ cup of cranberries and green onions. Bake for 15-18 minutes or until a toothpick comes out clean, keep an eye on it. 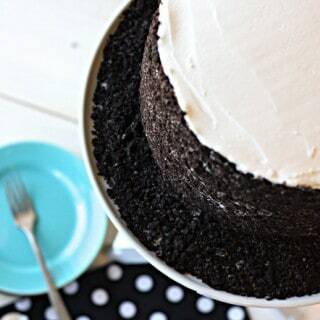 You don't want to overbake it or it will become dry. More cranberries recipes I’ve made can be found below. Wonderful recipe Diane – I bet this would be good as a base for cornbread dressing! Love it and so pretty too. Sharing! You beat me to it, I’ve been dreaming of a cornbread like this! 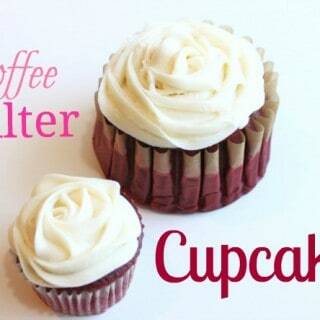 Sounds yummy, would dried cranberries work as well? Yes, they won’t give it the same moisture or flavor but I’m sure they’d taste good too.